The notes, technical information and guidelines below are aimed at helping to make printed jobs free from issues and unexpected results. They will be particularly useful to those who are supplying their own artwork. Call 020 7378 6754 or contact us here if you have any queries which are not covered and we’ll be happy to help. For large format printing we can print anything up to 1000mm wide by almost any length. 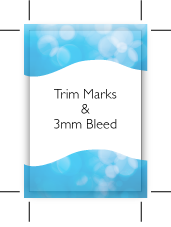 Please note that sizes stated must include trim marks and bleed where appropriate. Professional page make-up applications* like InDesign and QuarkXPress will be able to add trim marks to your artwork automatically, however if you’re adding them manually then we suggest they start 3mm outside the trimmed paper size and are each 3mm long. Bleed is required for any image which extends right to the document’s edge. Simply extend any photo or graphic of this nature a further 3mm outside the trimmed paper size. * Please avoid using desk-top applications like Word and PowerPoint when supplying artwork as they are not intended for high resolution, professional quality output. When preparing your artwork please make sure that the resolution of your photos and images is 300dpi (dots per inch, also known as ppi or pixels per inch). Any less than that may result in images looking ‘soft’ or even pixellated in the final printing. For this reason images saved from the internet – which are usually only 72dpi – are highly unlikely to be suitable for professional artwork and printing. Ideally all colour photographs should be saved in CMYK mode before adding them to your artwork layout. Colour photographs which are erroneously supplied in RGB mode will cause colour shifts on digital printing presses and even more severe problems on litho printing presses. Spot colours are only available via our litho printing process and should be properly set up in your high resolution artwork. Each additional spot colour will require a new printing plate (which will incur a plate charge) so care needs to be taken not to include unintended spot colours in your artwork. For black and white jobs, care needs to be taken to ensure that images are in either greyscale mode for ‘continuous tone’ images like photographs and tinted charts, or in bitmap mode (for ‘line artwork’ type images). Also, of course, make sure that only one ‘black’ swatch is set up in your artwork file, i.e. no second ‘spot’ black. Vectorise your fonts using the ‘outline fonts’ command in your professional design and layout package. Also remember to save a duplicate of your artwork file before outlining any text in case you need to edit it at a later date. Select the Medium preset in the flattening section when saving your final artwork file. * Transparency effects include transparency, translucency and drop shadows. Native Adobe Illustrator files so long as you convert fonts to vectors* (‘outline fonts’ command). When ready, you can upload your [artwork to our system here]. * Remember to keep a back-up of your files before outlining any text, in case you need to edit it in the future. Requesting and carefully checking a printed proof prior to committing to a full print run is recommended so as to catch any errors or technical issues not previously picked up. Doing so gives you one last chance to rectify things before it’s too late. However please bear in mind that proofs are only a guide to how the final printing will look, not an exact representation of it. Lots of factors affect how the final printing will look including the type of paper used, any surface coating (or lack of it) along with atmospheric conditions on the day, such as humidity. Save your file with ‘PDF/X’ and ‘Press Quality’ settings. If you have any questions or are unsure about settings or other factors relating to artwork or printing, simply call Southside Print London Bridge on 020 7378 6754 or contact us here and we’ll be happy to help. You can also request a quote here or upload your artwork to us here.